The famous Minnesota State Fair opened its gates last weekend to the record-breaking masses. Each year, the celebration seems to get bigger and bigger, hooking celebs, musicians, and national attention. As part of our yearly tradition, I took my dad to the MN State Fair on Monday. I always love the first Monday–even though it’s almost always a scorcher. As in years past, I ate the same foods, sampled new ones, and pretty much stuffed myself silly. That’s where I live when it comes to the Fair. It’s not a success unless you have to be rolled to the parking lot. One experience I did have that was new was noticing all the packaging. Since I’ve been writing about custom packaging, I can’t help but notice it. They always say it’s everywhere you go–but it really is. The Minnesota State Fair is known for its games, rides, music, food, and farm animals, but it’s arguably one of the biggest trade shows in the land. From the Education Building to the vendors set up in the Grand Stand, everyone is showcasing their wares, so to speak. I didn’t have a point of reference before, but now I’m noticing corrugated e-flute launch kits left and right. I’m seeing printed SBS paperboard where I used to see a novelty fan. I’m seeing diecut foam and turned edge setup boxes around every corner. The Minnesota State Fair must still remain a major hub of business. 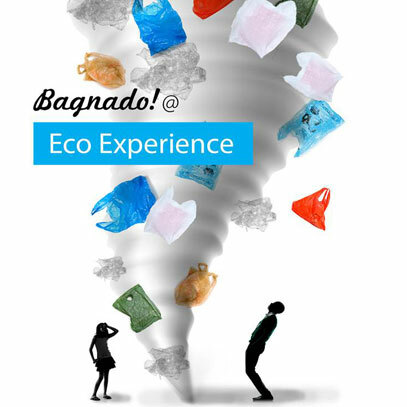 But one of the new attractions this year really spoke to me: The Eco Experience’s “Bagnado.” The Eco Experience has always been one of my favorite attractions at the Fair. It strikes the right chord between informational and fun. This year, they’ve ramped things up with the Bagnado, a 25-foot tall plastic tornado, representing the grocery bags and packaging that are tossed away daily. In Minnesota, that number averages about 12 pounds of packaging per second! That’s why I’m proud to be associated with Sunrise Packaging. Sure, we have eco-friendly products like corrugated cardboard boxes–even eco-friendly binders and name badges printed with soy-based inks! But on the other end, we specialize in packaging that you can keep. That you can reuse. Presentation packaging is reusable packaging. Custom boxes, laminated with aqueous print coatings are designed to stand up to the effects of repeated, everyday use. That’s more than you can say for the plastic bag, which sadly, is intended to be thrown away. Packaging is a necessary part of our world. Business, retail, storage–it all needs packaging. But packaging you can keep, that you want to keep? That’s the bonus of presentation packaging. Long story short, if you’re visiting the Minnesota State Fair this year, be sure to stop by the Eco Experience to learn other tips about reducing waste and reusing your post-consumer materials.